Latin America is in desperate need of sustainable solutions for flagging productivity and economic growth. Artificial Intelligence (AI) may seem like an unlikely ally in the search for sustainable growth, but it could form an important part of the answer. AI can be seen as a new factor of production that can help address future labour shortages and a chronic productivity deficit in Latin America. Our economic modelling and analysis of business cases across the region shows how. 1. Through intelligent automation, which differs in a crucial way from all previous forms of automation in that AI machines are able to learn and therefore actually improve over time, rather than degrade. 2. Through augmenting existing labour and capital, which means that people can be far more productive when supported by machines, and machines themselves can learn and improve their own performance without human supervision. 3. Through innovation diffusion, which refers to how innovation begets further innovation, for example by stimulating new ideas and business models among adjacent businesses and industries in a spillover effect. 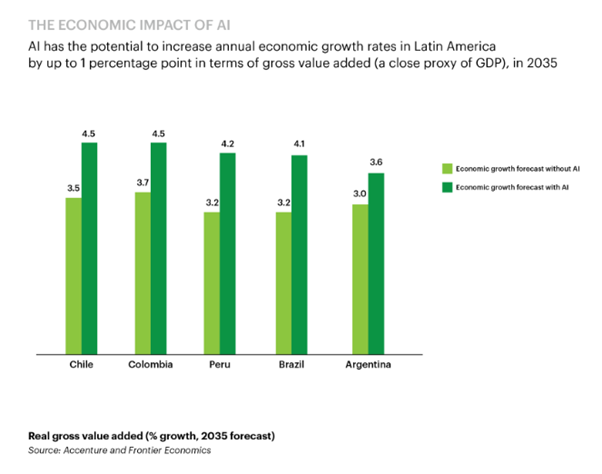 On the basis of these three channels, we analysed five Latin American economies, as well as several other countries around the world, and found that AI has the potential to add up to an entire percentage point to annual economic growth rates in the region by 2035. Can Latin America be a major AI player? Latin America is already taking AI very seriously. Both business leaders and consumers exhibit a strong appetite for using AI tools and capabilities. Mining companies are already employing autonomous machines in Peru’s mines; job recruiters draw on emotion analytics algorithms in Chile; and customers of banks, airlines and retailers all across the region are talking to chatbots. A recent Accenture survey found that 83% of Brazilian financial service consumers would trust banking advice that was entirely generated by a computer. Latin America’s AI efforts also include cutting-edge innovation, where some businesses are even outpacing Silicon Valley. The Not Company, based in Chile, uses machine-learning algorithms to analyse the molecular composition of animal proteins, connect them with the related human sensations of taste and smell, and then create plant-based versions of normally animal-based food products. Some global firms have noticed the region’s appetite for AI. For example, Unilever chose Brazil to develop and launch an autonomous forklift, before rolling out the product to manufacturing units around the world. Multinationals, including our own, are increasingly setting up innovation centres in Latin America, where AI solutions, including machine learning, hybrid intelligence and augmented reality, play a growing role in solving real-life client problems. Latin America’s AI pioneers are not only looking for global solutions, they are also using AI to target region-specific issues. Take Chazki, a logistics start-up from Peru, that realized the lack of clear postal addresses across Peru was a major problem for e-commerce firms. They partnered with the Universidad San Pablo in Arequipa to build a robot that learns the coordinates of delivery addresses and essentially builds a new postal map, including destinations where no formal address previously existed. The company has expanded to Buenos Aires in Argentina, noting that this problem is prevalent in the outskirts of large cities across Latin America. Many of Latin America’s traditionally important sectors are ready for help from AI, especially agriculture and commodities, the public sector and manufacturing. In mining, the health and safety improvements brought by AI are no less important than the efficiency gains. For example, Peru’s National Engineering University has developed an autonomous robot that detects dangerous gas leaks. Chile’s Codelco, the world’s largest copper producer, was a global pioneer in the adoption of autonomous trucks. Large-scale agriculture players in the region are already using AI to dramatically improve the speed and accuracy of their planting and crop management techniques. Raízen, Brazil’s leading sugar and ethanol producer, recently announced a partnership with Brazilian start-up Space Time Analytics to use AI to forecast, up to one year in advance, the size of the sugarcane harvest. The size and range of opportunities in Latin America’s public sector is vast. In healthcare, for example, researchers at the University of São Paulo are developing machine-learning technology that will rapidly assess the likelihood that patients are suffering from dengue fever, zika or chikungunya when they arrive at a medical centre. This will help overwhelmed doctors know which people to treat first during future outbreaks. AI’s ability to improve capital efficiency is crucial for the many Latin American industries burdened with the high sunk costs of manufacturing machinery. Ubivis, a Brazilian start-up, installs sensors and external drivers in industrial machines that generate large quantities of data. This data feeds machine-learning processes that are able to predict problems before they arise, saving on downtime and wastage, all without human supervision. The company helps clients in industries as varied as agribusiness, metallurgy and cosmetics. As heartening as these Latin American illustrations are, we must not minimize the challenges that need to be addressed. Our research reveals numerous structural deficiencies that hamper Latin America’s ability to integrate new technologies into the economy. Common regional weaknesses include the quality of education systems – from primary to university levels – and of scientific research institutions, as well as weak research and innovation ecosystems at national, regional and global levels. Low levels of trust and a lack of collaborative mindsets hamper the creation of such an environment. The most significant challenges to the adoption of AI are no different in Latin America than anywhere else. They are about preparing stakeholders thoroughly for the major intellectual, technological, political, ethical and social questions that will arise as AI becomes more deeply integrated into our lives. There is no question that AI will generate a swathe of new jobs that we do not yet have names for and that new skills in areas like robotics and pattern recognition will flourish. Evidence suggests that most executives expect machines to improve human effectiveness and make their work more interesting. Businesses need to prepare their workforce for this AI future, training people to work effectively with machines, to teach those machines by example and even to learn from them. But it is also true that AI will eliminate other jobs, potentially worsen inequality and erode incomes for some parts of the population. The imperative – starting now – is for policymakers to proactively address and pre-empt the downsides of AI. For example, they must identify the groups that are at risk of being affected disproportionately by job displacement and create strategies that focus on reintegrating them into the AI-driven economy. Preparing for these new realities is not only about jobs. It also demands carefully crafting rules and regulations. For example, how should a driverless car’s algorithm decide to value one person’s life over another? Or what happens if a robot analysing medical scans makes an error? How do we apportion accountability? Who decides on the codes of ethics that govern unpredictable, self-learning algorithms? These are not minor questions and not for Latin America’s leaders to confront alone. They demand active engagement across industry groups, business and government and nations to develop appropriate guiding principles and codes of conduct. To some degree, both the cheerleaders and the doom-mongers are correct. The potential value that AI can bring to economies and to society-at-large is tremendous, from health and safety outcomes to transport and climate change. Yet the challenges that must be overcome to attain that value are immense. Our responsibility, as leaders from business, government and civil society is to present a complete and realistic picture of these opportunities and challenges for our citizens and employees, and to prepare them for their future with AI. Artificial Intelligence may sound futuristic and distant to many, but it is already here, in Latin America, and its impact on our daily lives is imminent. Let’s pivot the conversation from science fiction to pragmatic plans.